1. Tamiya are re-releasing two of their 1:100 kits; this time it's the CH-54 Skycrane #60024, and the KV-107 #60018 (see HKN #112), though whether or not they will be available outside Japan remains to be seen. Other items in this 'Mini Jet' series are / have been the UH-1B, AH-1G, and the SH-3A/D. 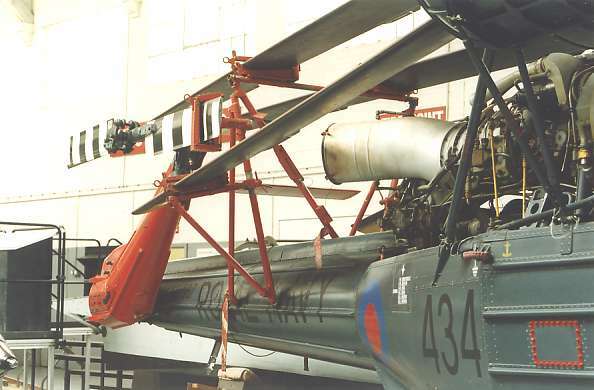 Resin engine platform, Rolls Royce Nimbus engine, float bag canister (2), rear fuselage section (including aft stub wing u/c attachment points and ventral electronics box), winch arm, landing light unit, and tail pylon unit. White metal undercarriage lower 'A' frames (2), u/c upper 'A' frames (4), u/c castor legs (4, with integral wheels), main rotor gearbox & drive shaft, Doppler antenna (2, inc. one spare), Nord AS-12 missile sight (2 parts), AS-12 firing box, radar altimeter antenna box, and foot steps (4, of which three are spares). Etched brass cockpit wind deflectors (2), tail fold join faces, winch hook, AS-12 aimer's control arm, rear-view mirror, float canister aft stays (2), float canister attachment frame (4 parts), blade antennae (3), VHFantenna, foot step (alternative to the white metal part), winch bracing strut, main gearbox stays (4), thermocouple wiring loom (engine detail), windscreen wipers, main rotor control rods (4), aft u/c stub wing braces (2), engine control rod assy., exhaust blanking covers (2), and torpedo / depth charge carriers & sway braces (6 parts). This looks like a very comprehensive conversion & detail set, well finished and moulded . As usual some of the small brass parts could be replaced by scratch-built items with a more realistic thickness, but commendably the float canister attachment frame comes in several parts that build up into an assembly with a true profile and detail on both sides. There is of course almost unlimited scope for more detail to be applied to the engine, and if the tail is to be folded then perhaps main rotor fold support frames will be needed too! To complete the project Airwaves interior detail set AC72-165 is recommended, and of course they can also offer sets that provide Nord AS-12 missiles (SC72-101) and several types of torpedoes (SC72-128 and SC72-129). It is probably only a matter of time before some of the parts are offered in a separate set for detailing the Scout, but I have no specific information to that effect. 3. 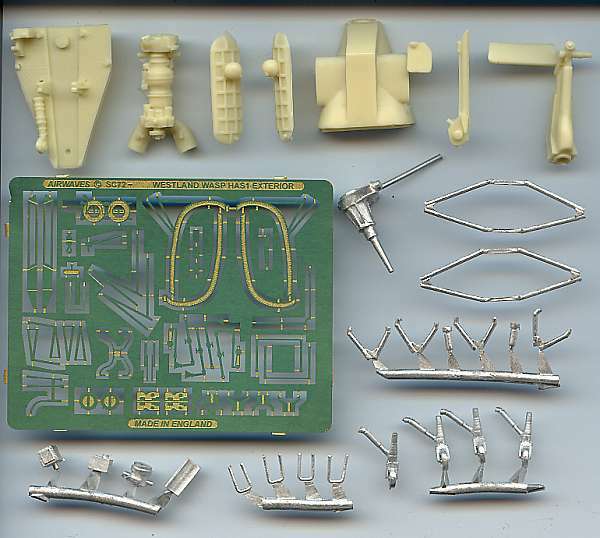 Cobra Company have supplied this image of some of the new HH-60H and HH-60J conversion parts for their forthcoming 1:48 conversion sets. In the final product these will be combined with existing parts from the SH-60B detail set and some new interior rescue items. Chris Miller (Cobra Co. Chief Snake) says "thanks to those of you who decided to order things that you wanted now, I was able to purchase the materials needed to move ahead with the first SH-60 resin sets. Release date is targeted for October 3rd, 2003 at the IPMS USA Region II Convention in Reston Virginia. See you there!". CS-07 will comprise external resin conversion parts and new tigertail decals including all stencilling. Also included are detailed colour photo-sheets and instructions. Available in both 1:72 and 1:48 scales, the 1:48 set (48CS-07) will also have photo-etched 'meshed covers'. The decals will not be available separately. 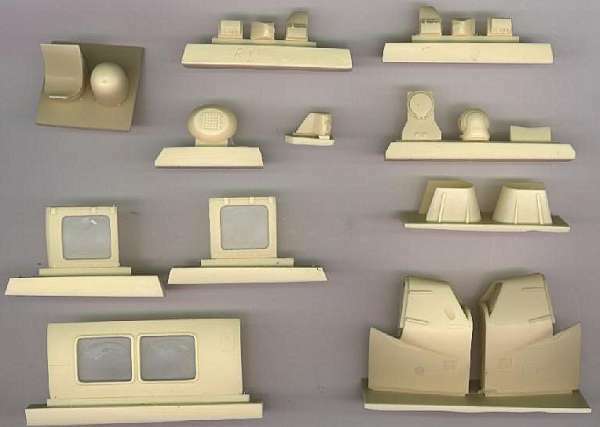 48CS-32 will be a resin interior set for the 1:48 Italeri SH-60B kit. Hawkeye's flier says "This kit is a complete super detailed interior kit unlike anything ever done, it contains full resin parts, photoetch, decals and colour photos and drawings". The kit and both Hawkeye sets are available as a 'limited-edition pack' with a free 'mini RAN Colour Seahawk Walkaround' book if ordered now from Hawkeye. 5. Prop & Jet's replacement vacform canopies for the Zvezda Mi-8/17 are now available, though don't ask who sells them because at the moment I don't know! There isn't any great difference in overall shape between this and the kit item, but the shape and arrangement of the individual window panes has been corrected. The difference in profile in comparison with the unsatisfactory Ciro replacement canopy (C-009 or 72-009, originally sold for the KP kits) is quite marked. 6. Behemoth ('Begemot') are going to release a new sheet of decals covering both the Mi-28 and the Ka-50. Thanks to George Filyagin, Gennady Kosyanenko, Tony Morgan, Chris Miller (Cobra Co.), and Steve Evans (Hawkeye Models Australia).